On Thursday, 8 November, 2018, Jayasree K. Iyer, Executive Director of the Access to Medicine Foundation, will join the 2nd Women Leaders in Global Health conference in London to talk about social entrepreneurship and gender in global health. The event will bring together established and emerging leaders from across sectors and cultures to work towards gender equity in health leadership and to improve health for all. 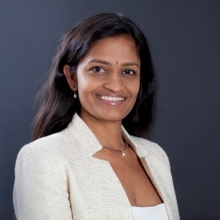 Jayasree K. Iyer leads the Access to Medicine Foundation as Executive Director. She directs the Foundation’s strategy, its stakeholder dialogues and research programmes. As a spokesperson, she is actively involved in stimulating change within the pharmaceutical industry. The conference, hosted by the London School of Hygiene & Tropical Medicine, will address women leadership in the fields of humanitarian emergencies, sexual and reproductive rights, mental health and climate change to engage in the latest thought leadership on advancing women in global health. It also aims to support mentoring and skills building opportunities to support women in all forms of leadership from local communities to global organisations, from science to politics.